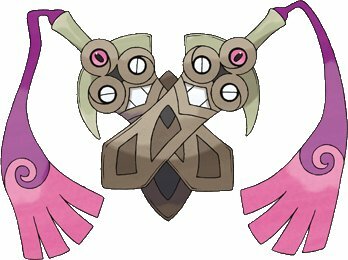 Uh… Vayatii… we already knew both of those… Dialga posted about the Mewtwos the other day, and we made a topic about Pokemon: The Origin a MONTH ago. The cat Pokémon, Nyaonikusu is to be called Meowstic. The Team Flare admins are: The purple-haired woman is Celosia, the orange-haired woman is Aliana, the green-haired woman is Bryony, and the blue-haired woman is Mable. The final one of the lot is a man called Xerosic, whose red goggles and hair make quite an impression. The actress Karune is to be called Diantha. What am I gonna record for 10 seconds?! Ugh, don't even remind me; still pissed about fighting type's new weakness... As well as steel types losing resistance to ghost... Now I don't even want the ghost/steel type sword Pokemon. -Electric types can no longer be paralyzed. -Grass types are now immune to "powder and spore moves" (i.e. Cotton Spore, Stun Spore, -PoisonPowder, Rage Powder, Sleep Powder and possibly Spore). 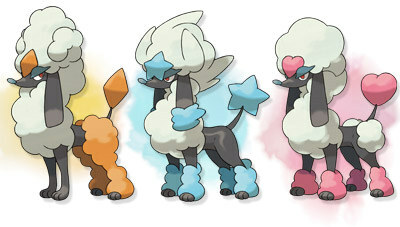 That blue Furfrou looks like a boss. I want it. 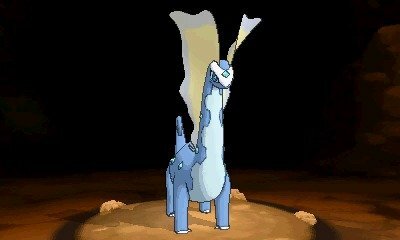 We have the evolutions of the fossil pokemon, Amaura and Tyrunt. The names are Aurorus and Tyrantrum. 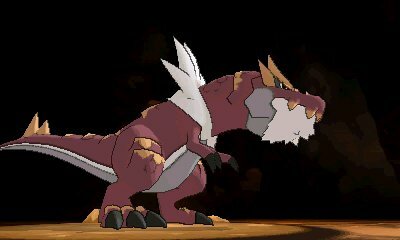 Tyrantrum keeps its Rock/Dragon-type and the ability of Strong Jaw. It also has the move Head Smash. It reigned over 100 million years ago as king. It's biggest weapon is its jaw that can tear through an iron plate as if it was paper. Aurorus' move, Freeze Dry, is confirmed to be super effective on Water-type Pokémon. T-rex pokemon here I come!!! Lol only just Vaya checked it on the facebook page, this pokemon looks awesome! Double edge just took a new meaning...we getting so close to October now I can taste it! Found this on the net but not confirmed. Apparently there will be 2 Mega Evolutions for Charizard. One exclusive to X and one to Y. It also seems Serebii.net will not be releasing any more spoilers until the game is released for fear of legal action against the site due to high volume of spoilers. The y version one seems more of a shiny mega charizard but it does look rad, heh it doesn't even look like charizard anymore! Ah you beat me to announce the type.